My friend Ali lives in a beautiful apartment and is an amazing host. She had us all over for a brunch gathering a year ago, and when she extended an invitation again recently, I was so excited. Ali entertains like a grown up does, with cloth napkins, beautiful table settings, and superb food. 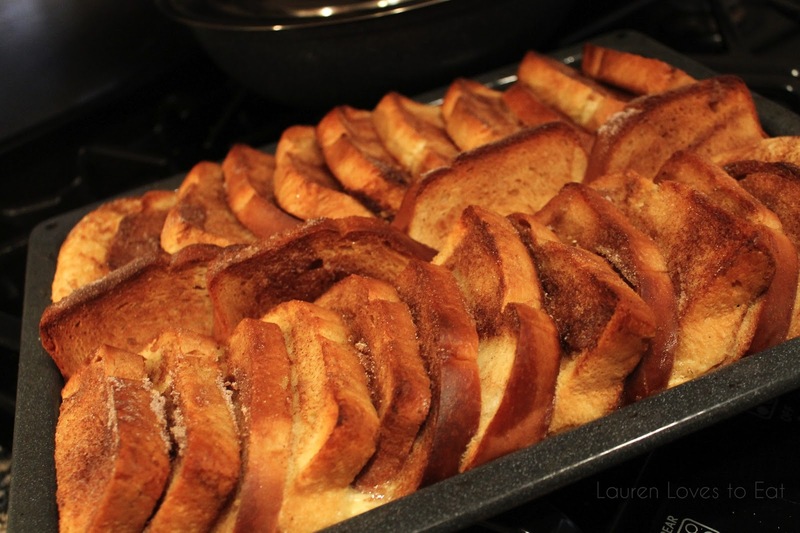 During our group's email thread, I suggested trying Smitten Kitchen's cinnamon french toast recipe for 2 main reasons: 1. 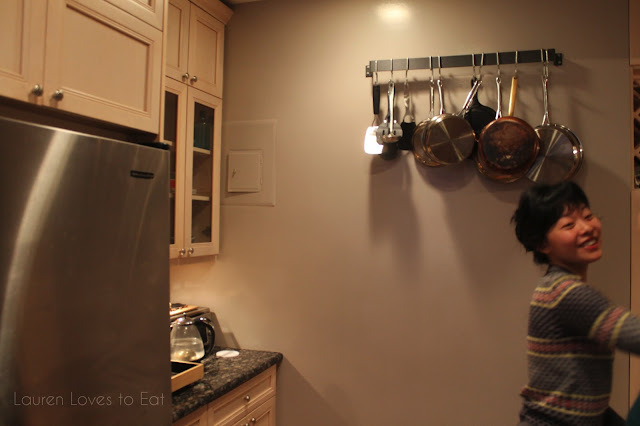 I've tried several recipes from the cookbook and the blog, and have been very happy with the results. 2. It's a great brunch dish that can be prepared ahead of time and then just heated up in the oven before serving. Ali prepared this French toast and made a few edits along the way. She lessened the sugar and replaced salt for nori fumi furikake (a Japanese rice seasoning). The french toast was perfect, slightly crispy along the crusts and soft and eggy in the middle. 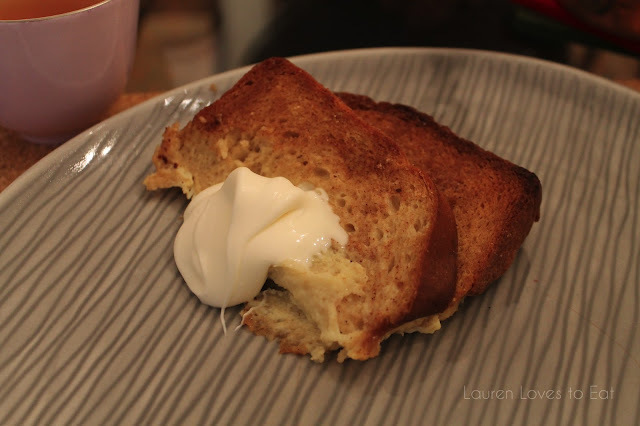 French toast with a dollop of creme fraîche. 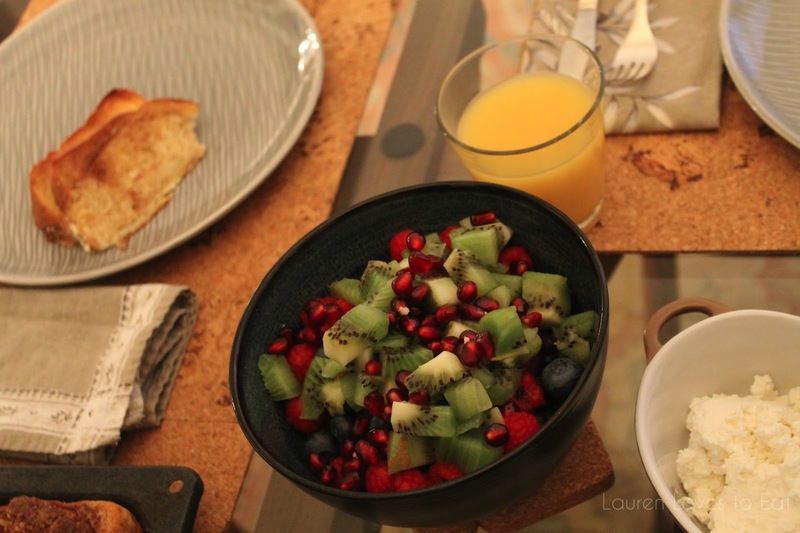 A mix of very fresh fruits from Whole Foods: pomegranate, blueberries, raspberries, and kiwi. 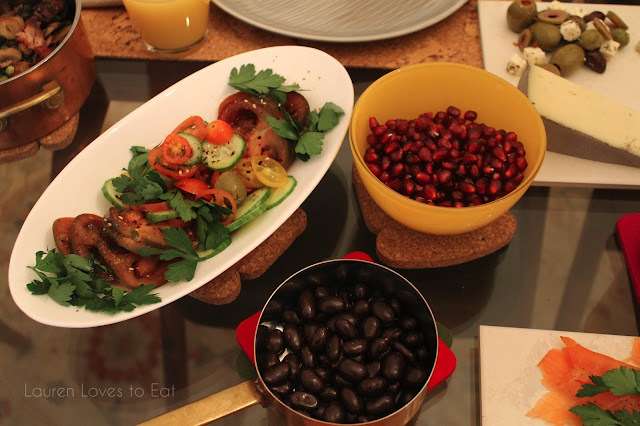 Tomato cucumber salad, pomegranate Sang helped peel, and chocolate covered edamame beans. The beans were surprisingly crunchy. 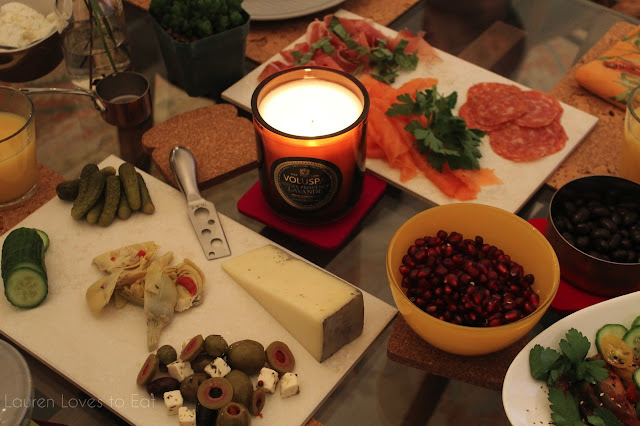 Meats and cheeses. The Sottocenere truffle cheese from Whole Foods had very strong flavor and a great hard texture. 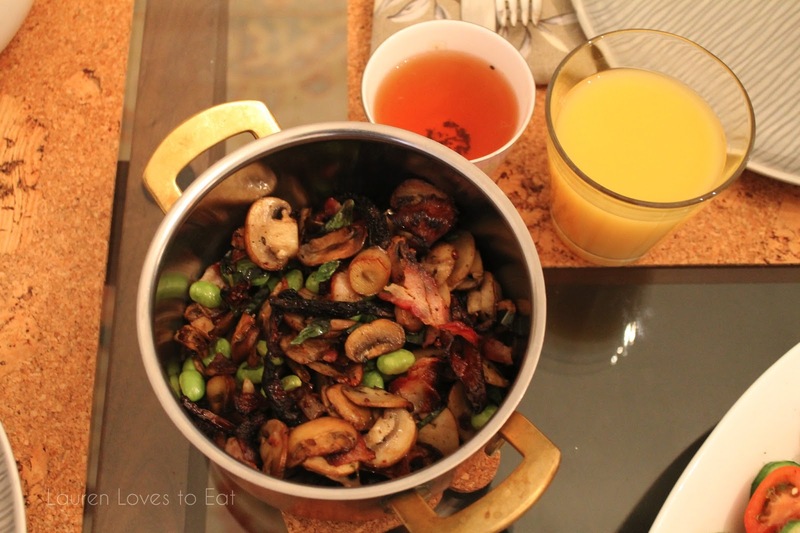 A delicious sauté of mushrooms, edamame, and bacon. This will probably become my new weekday dinner dish, as it's so easy and yummy. A blurry shot of Ali. 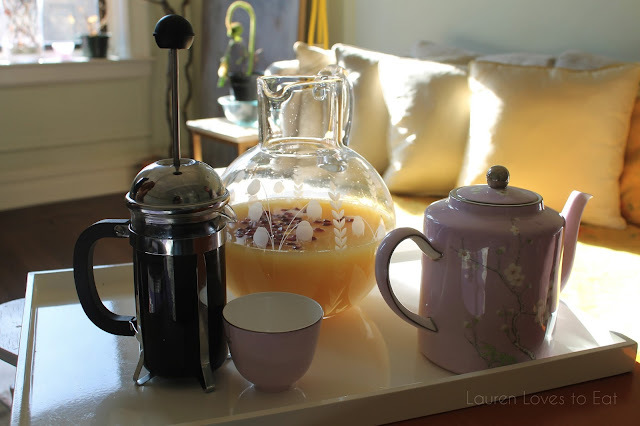 To fend off an inevitable food coma, we gathered in the living room for coffee, more mimosas (with pomegranate), and ginger almond cookie tea. Thanks for another amazing brunch, Alz! Great catching up with you amongst all the frantic shoppers at Trader's! Looking forward to seeing you Wednesday!